After the mysterious death of his Aunt, a confirmed skeptic lawyer, Bryan Becket, dismisses reports that her house is haunted and moves in. Immediately occurrences begin he cannot explain. And beyond the occurrences there is something about the house which gnaws at Becket - some strange connection he senses he has with the house's past. Soon, the haunting turns personal, he hears voices suggesting clues to a deep mystery. 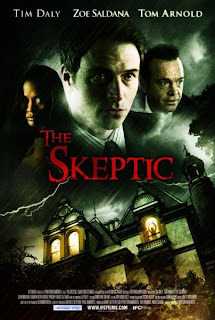 He questions his sanity, seeks medical help, but instead finds assistance in a young psychic who immediately declares, "There's a very bad secret in this house." Together they embark on a terrifying journey to uncover the secret - a journey which leads them deep into the recesses of The Skeptic's own troubled mind.